Angelica Lopez Moyes is amazed that her 1st-grade son can speak Mandarin. But she is concerned that his dual-language immersion program at Castelar Street Elementary School could be jeopardized if a charter is co-located on the campus. 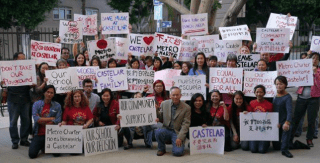 Castelar, founded in 1882 and the second-oldest school in Los Angeles, has 570 students and is at about 75 percent capacity. Under Proposition 39, passed in 2000, the remaining space can be given to a charter.